Mother’s Day. Teacher appreciation. Just because. Say thank you with this no-maintenance bouquet. There’s no watering, no weeding-just enjoying. This easy-to-assemble kit comes complete with the petals, stems, and buttons to create the flowers, as well as four different tags to make this the perfect gift for any occasion. 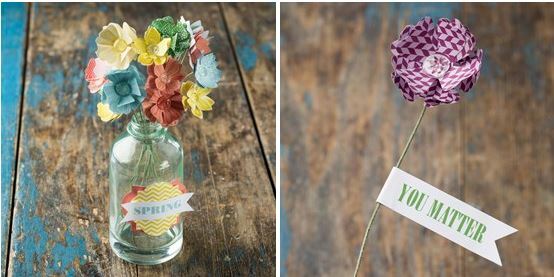 All you need is some paper, ribbon or a vase to add the finishing touches to the bouquet. As if that weren’t enough, the kit contains a “baker’s dozen”! This means you can create and give (or keep) a dozen flowers, and have a bonus flower left over to pass along to someone new! Give it to someone you wouldn’t normally think of: a teller at the bank, a grocery store clerk, or the librarian at your local library. Anyone you encounter on your way that you’d like to give a little “thank you”! This kit makes a great gift, both assembled and unassembled. You may want to give it as a fun do-at-home project, or create it yourself to give.